I have talked about this service many times with Nick Billowes (a New Zealand friend and colleague) and sad to say Nick we have missed the entrepreneurial boat! 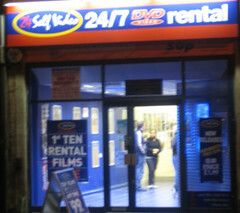 Here (West End suburb of Leicester) you can access DVD all day every day through touch screens. You can see what is available, read about the films/games, even see the trailer. Then simply insert your ‘charged’ membership card an chose the rental period. This entry was posted in Learning thoughts on October 24, 2005 by Stephen Powell.